I've had my FitBit for a couple of months and it's so helpful! It gets me to move, even when I'm not thinking of it as exercise. 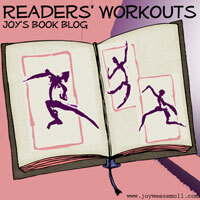 Glad to have you join Readers' Workouts! Have you started to feel bare when you forget to put it on for the day (if you have forgotten it)? Worse than that, I resent every step I take that doesn't get counted!